What are the Advantages of Healing the Body with Reiki Energy? There are so many advantages to working with Reiki energy as it supports and establishes spiritual equilibrium and mental well-being. 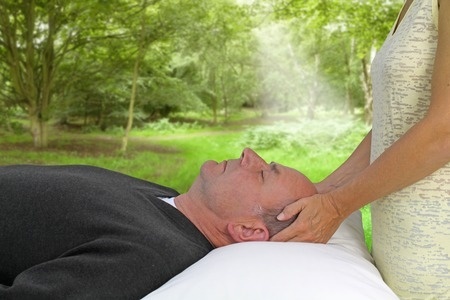 Reiki is an extremely pleasant, holistic method of healing . As we experience Reiki we feel it loosening up blocked energy and it promotes a state of total relaxation. This is so healthy for us. Reiki also helps our body to cleanse itself of toxins and poisons. The energy of Reiki adjusts itself according to the needs of the recipient, which means it is not about the practitioner doing counseling, but the body receiving energy to heal itself..
Reiki is also very effective for treating animals and plants. Reiki is suitable for people of any religion. There is no prejudice nor discrimination. It is not aligned with ay belief system or religion. It is purely the movement of energy which helps your body to heal itself. Reiki supports your own immune system to be at its best and helps you regain the balance in your body. It helps grounding / centering (= calming down) yourself. It revitalizes your energy levels. It can be used in conjunction with other body- work and natural therapies and you can expect better results because of this. Virtually there is no limit in the application of Reiki so therefore it would be wonderful if everyone on the planet could experience this wonderful healing modality. If you would like to book a Reiki energy healing session, Leonie Feast-Jones is one of Australia’s most experienced Reiki Masters. Leonie also has the ability to see and feel energy and can help you get your body back into balance using Reiki and other healing modalities.